What if a memory that you cherish, a memory that you remember with stunning clarity, is not really yours? What if you never made it? I have a few of these calcio memories tucked away in the bank. They are like false currency, but only upon closer inspection do they reveal themselves to be counterfeit. 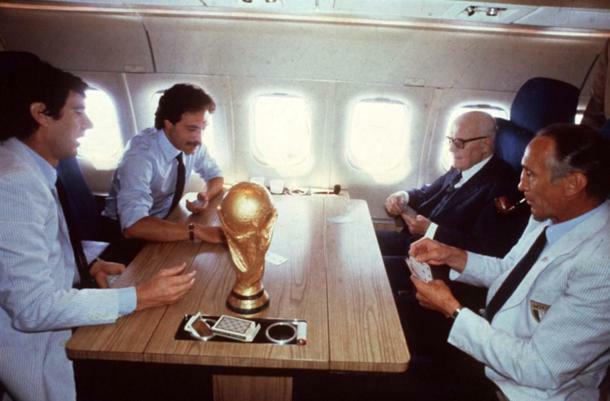 I was three when Italy won the 1982 World Cup in Spain, when Marco Tardelli roared with abandon in the final against West Germany, when coach Enzo Bearzot played cards with the then Italian president Alessando Pertini, Dino Zoff, a moustachioed Franco Causio, and, of course, the World Cup itself--gold, impassive, self-satisfied. By all accounts, I was more interested then in Ernie's antics on Sesame Street, or Scooby Doo's sleuth work that seemed just like antics to me, or not disgracing myself during a meal. I had different priorities back then positioned as I was in that painfully irrecoverable space between consciousness and lucidity (I don't drink). Why then do I remember the 1982 World Cup? 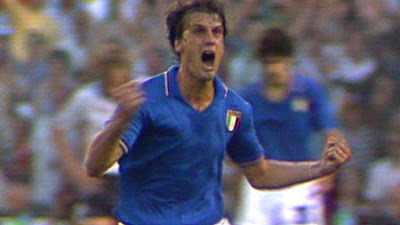 What right do I have to Tardelli's facial contortions, to Pertini raising his arms in glee after Italy's third goal in the Final? The answer reprimands you: you consumed the images later and you stole them for yourself. They are now part of an iconography that you have internalized and fabricated in parts. You have swallowed falsehoods along with truth. "For many years, one of my indelible memories of Italian football was, in fact, mis-remembered. Italia'90 had many moments that could lodge in a young football fan's mind. There was Roberto Baggio's flight through the hapless team of what was then Czechoslovakia, or Salvatore Schillaci's bug-eyed celebrations after scoring a goal. But the most enduring memory I have is of a tearful Aldo Serena sinking to his knees after missing a penalty against Argentina in the semi-final. The only problem is the man doing the sinking was Milan's Roberto Donadoni, who had missed a penalty before Serena. I had, as I recently found out, unwittingly conflated Donadoni's dejection with Serena's; or, perhaps my Rossonero disposition had led me over the years to ascribe the most defeated gesture of that bitter penalty shoot-out loss to Serena, who was then at Inter and who had enjoyed his best years there as well. Whatever and whomever, the net effect of Italia'90 and its pains and tears was that I was an Italy fan for life." Mis-remembering rewarded me with calcio, a life-long gift. But when does mis-remembering dangerously shade into manufacturing? Each flicker of an image or footage from 1982 that has insinuated itself into my memory now passes itself off as lived or seen experience. I was merely alive in 1982, but that seems to have given me license. I have seen Gianni Rivera help Italy to the 1970 Final on video, but that Italy was older than I am. I have seen black and white pictures of the Italian squads of 1934 and 1938, but that Italy was older than my father. The one from 1982 though sticks, and not just because Italy won, but because it happened around the same time I did. This seems like vanity that I can't apologize for. I am richer because of these memories, and it is only when I hold them up to the light of the 1990 World Cup, the 1994 one, the 1998 one, and the 2006 one do I realize that something about them is different--perhaps counterfeit, but, somehow, not devalued. So, when I say to my friends, "I don't really remember the 1982 World Cup, so 2006 was something special" it is at once a lie and the truth. On this day, thirty-six years ago, Italy won its third World Cup, a triumph that I at once remember and don't.